This entry was posted on June 25, 2013 by LaurelG, in Legislative Report, News. Bookmark the permalink. We have some great news to share with you all today surrounding your PERA retirement! 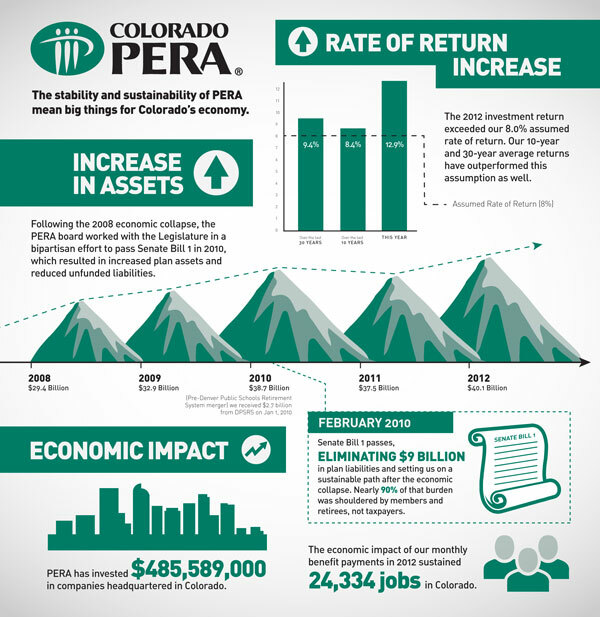 Despite criticism and assaults on its sustainability and soundness, Colorado PERA released their Comprehensive Annual Financial Report (CAFR), and announced today that Strong Investment Returns During 2012 Add $4.6 Billion to PERA Trusts. 1. Get this info out to friends and neighbors and most importantly, legislators. Write a Letter to the Editor to your local newspaper(s). Secure PERA has made it easy to do so, providing a portal as an easy way to submit your letter to multiple newspapers. You can find that page here. 2. Contact Governor Hickenlooper and tell him that PERA IS IMPORTANT TO YOU. Please see all of the information below, and pass your opinion on to the Governor. And as a reminder, your ACSPP is part of the Colorado Coalition for Retirement Securities (CCRS/Secure PERA), which also posted this extremely informative Media Release today. Denver, CO – Today, the PERA Board of Trustees released their Comprehensive Annual Financial Report (CAFR) which showed a 12.9% rate of return on their investments for 2012. This number has exceeded the Board’s assumed 8% rate. Since being elected in 2010, Colorado State Treasurer Walker Stapleton has consistently called PERA’s 8% expected rate of return overly optimistic and unattainable – today he was proved wrong. Over the last 30 years PERA has averaged a 9.4% rate of return and over the last 10 years it has averaged an 8.4% rate of return. Treasurer Stapleton was not present at the meeting today and hasn’t attended a PERA board meeting in 12 months. “Our State Treasurer is drastically out of touch with the realities of public employees and PERA. His misinformation over the past year has needlessly concerned folks about the state of PERA’s finances. Today’s CAFR shows that PERA’s reforms are working and PERA is moving in the right direction,” stated John MacPherson a retired teacher and administrator from Denver Public Schools. In 2010 employees, retirees, and employers came together with the Legislature to make PERA more fiscally secure after the stock market crash of 2008. These changes resulted in the bipartisan Senate Bill 10-001, which increased the retirement age, increased employee and employer contributions as well as lowering the amount of the cost of living adjustment (COLA) retirees receive. Since passing this bill, PERA has eliminated $9 billion in plan liabilities and nearly 90% of that burden was shouldered by employees and retirees, not the taxpayers. In 2013, PERA will pay retirement benefits of over $3 billion to its retirees, with the vast majority of these dollars being spent here in the Colorado economy. You can see a county by county breakdown of the paid retirement benefits here. PERA will also invest nearly a half billion dollars into companies headquartered in Colorado, which contributes to its vast positive impact on Colorado’s economy. “Today we were able to see how all of the sacrifices we made in 2010 helped to turn PERA’s financial picture around, eliminating $9 billion in liabilities. Today is a good day for Colorado and for its public employees,” concluded MacPherson. You can read PERA’s media release on the CAFR release here. Follow this link to the Governor’s “Share Your Opinion” form and let him know why PERA is so important to you and ask for him to support public employees and the shared sacrifice we agreed to in 2010. I suggest selecting “State Personnel” for the jurisdiction, no topic, and then entering PERA as the subject. There is then a box for you to enter your comments in. As we move forward with the reforms we implemented in 2010 we need the Governor’s support and he needs to hear from you so that he knows supporting public workers and PERA is a very important issue. Below is an infographic from PERA. Please share this graphic on your Facebook page and to your email contacts. These types of graphics help to visually summarize information and make it easier to understand. You can find the graphic on the Secure PERA and Association of Colorado State Patrol Professionals Facebook page(s) and share it from there – or your can right click on the image below and save the photo and then post it yourself. To save a larger file to share and circulate, please visit here. The following members were elected to the PERA Board and announced at today’s board meeting. Thank you to all of you who turned in your ballots. We also want to take this time to acknowledge how hard the PERA board works on our behalf, thank you! You can read PERA’s board election announcement here. PERA does an excellent job keeping its 450,000 members informed about the organization and about their individual retirement accounts, but younger members aren’t always focused on their retirement because they have other, more pressing concerns in their lives. That’s why PERA recently launched a blog called The Dime, in an effort to reach out to and engage younger members on matters of personal finance and public employment. Though PERA members of all ages will find its daily content useful and topical, The Dime tries to meet these younger members where they’re at in their lives – buying their first home, thinking about going back to school or saving for their children’s’ educations. From information on what health care reform means for Colorado to tips for saving money on your summer vacation to financial resources and tools for millennials, The Dime offers a unique, thoughtful and creative perspective. You can bet your bottom dollar. Thank you all for your support of Secure PERA, we appreciate it very much and will continue to fight on your behalf to protect retirement security for all of Colorado.